Any time you can find a product that allows you to do multiple things with it, you should be happy. When it comes to cleaning your house, it can be a pain to get out all of the different tools and equipment necessary to clean everything. The VonHaus 600W 2-in-1 Corded Upright Stick & Handheld Vacuum Cleaner won’t take care of all of your cleaning needs, but it’s definitely more than just a vacuum cleaner. In addition to the powerful suction on this machine, it also comes with several accessories to transform it into a versatile cleaning machine. Whether you have carpet, rugs, hard floors, stairs and any type of furniture, this vacuum is capable of cleaning all of them. What do People Like Most about this Vacuum? When it comes to the VonHaus 600W 2-in-1 Corded Upright Stick & Handheld Vacuum Cleaner, people like the power and versatility. The 130 air watts of power are remarkable for a stick vacuum. It can be used with an extension tube or without and will still get the same amount of suction. A little known factor that people thoroughly enjoy about this vacuum is the HEPA and sponge filtration system. What makes that a wonderful feature is that it basically absorbs dust and dirt into the machine rather than blowing it back into the air to re-circulate in your house. Do you seem to always sneeze when you vacuum? 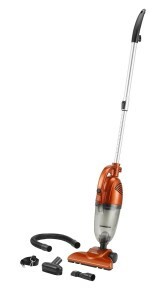 Try this VonHaus vacuum and you may notice a big reduction in your allergies because of the lack of dust circulating. When you have a vacuum that is versatile and strong enough to be good on hard floors, carpet and a variety of furniture, you know you have a good one. That is one of the top things that people like about this vacuum because it eliminates the need for other cleaning equipment that they use in their house. What do People Not Like about this Vacuum? With the good things, there is also a little bit of bad. The HEPA and sponge filtration is good, but it can also be a little difficult to clean. Since the filter attracts and absorbs dirt, it can be difficult to clean at times. That’s a testament to how well it works, but it is also a little frustrating when you have to clean it. The size is another issue that some people have. Since it is so light, people say that it can be hard to keep on the floor because it doesn’t have a lot of weight to keep it down naturally. Also, the head size is fairly small, so you aren’t able to cover a lot of ground at once. Considering the versatility and power that this vacuum has, it is worth being a little smaller than the average vacuum cleaner. You won’t have to worry about pushing around a heavy and bulky vacuum, so you will be able to do your cleaning all at once. If you have different surfaces that you need to clean, then the VonHaus 600W 2-in-1 Corded Upright Stick & Handheld Vacuum Cleaner is perfect for you. It normally retails for about $80, but you can find it on Amazon right now for about half the price. VonHaus has built a strong reputation of being a company that manufactures quality vacuum cleaners. Not only do they manufacture floor care products, but they also make a variety of tools for the garden and outdoors, storage accessories, television accessories and other tools for the house. They hold themselves to a high standard as a company and pass that along to their consumers. Give VonHaus a try if you’ve never owned one of their products.